U.S. IOOS and the Office of Naval Research (ONR) working with Stanford University, UC Santa Cruz, and the NOAA Southwest Fisheries Science Center Environmental Research Division (SWFSC/ERD) have launched the national Animal Telemetry Network Data Assembly Center (ATN DAC) to provide reliable and accurate biological and physical observations data. The development of this network began in 2011 and the result is a portal providing data that can be used in modeling ocean dynamics, defining critical ocean habitats, and forecasting marine ecosystem features to support US IOOS societal benefits needs, particularly to improve predictions of climate change, more effectively protect and restore healthy coastal ecosystems and enable the sustained use of ocean and coastal resources. The ATN DAC in its current version provides access to 48 different species such as sharks, sea turtles, seals, whales, tuna and squid, with deployment dates ranging from 2000-2014. Animal telemetry technology is leading to profound advancements in understanding animals and how they interact with their environment. 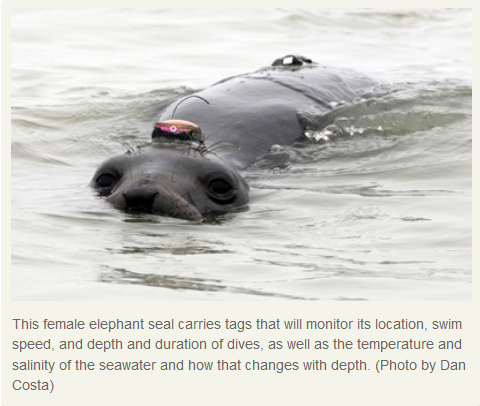 Click here for more information on the important work being done in the area of animal telemetry.